"Elder [Porphyrios], what answer do you give to those who ask about the gifts which God gave you and seek some kind of explanation? Because others ask us and put forward the well-known proverb, "after Christ nobody is prophet." "May God grant me to speak with judgment and have thoughts worthy of what I have received, for he is the guide even of wisdom and the corrector of the wise. For both e and our words are in his hands, as are all understanding and skill in crafts. For it is He who gave me unerring knowledge of what exists, to know the structure of the world and the activity of the elements; the beginning, the end and the middle of times, the alternations of the solstices and the changes of the seasons, the cycles of the year and the constellations of the stars, the nature of animals and the tempers of wild beasts, the power of spirits and the reasoning of men, the varieties of plants and the virtues of roots; I learned both what is secret and what is manifest, for wisdom the fashioner of all things taught me." 'There is in her a spirit that is intelligent holy, unique, manifold, subtle, agile, clear, immaculate, distinct, invulnerable, devoted to goodness, keen, irrisistable, beneficent, humane, steadfast, sure, carefree, all-powerful overseeing all and passing through spirits that are altogether intelligent, pure, and subtle. For wisdom is more mobile than any motion, she pervades and passes through all things by her pureness. For she is a breath of the power of God, a pure emanation of the glory of the Almighty; therefore nothing defiled gains entrance into her. For she is a reflection of eternal light, a spotless mirror of the working of God and an image of his goodness. Although she is one she can do all things, and whilst remaining in herself, she renews all things; in every generation she passes into holy souls and makes them friends of [God's] and prophets." Today marks the anniversary of the date when Elder Porphyrios passed away (December 2nd 1991). He was an incredible Grace-filled Elder who helped thousands come closer to Christ. There is much written about him (see the list of books below), and his life and works are worth reading. He is honored very much in Greece and all over the world. This past Sunday, the Monastery of the Transfiguration of Christ which he founded in Milesi (near Athens) had a Memorial Service for him, and I read that 3000 people were in attendance! Already some have written services in his honor. He was and continues to be a treasure of our times. May we all have his blessing! 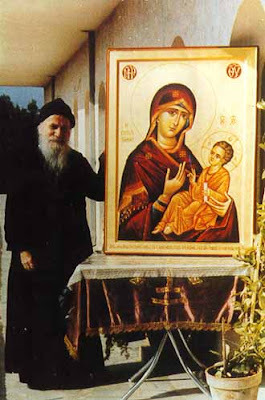 For passages by Elder Porphyrios on "The Upbringing of Children", see: http://www.philokalia.org/porphyrios_children.htm. 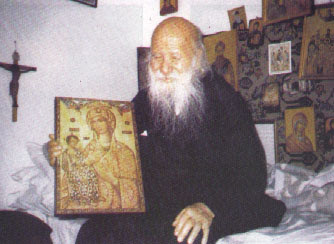 For numerous stories and teachings from Elder Porphyrios, see: http://www.oodegr.com/english/biblia/Porfyrios_Martyries_Empeiries/perieh.htm. "This is the way we should see Christ. He is our friend, our brother; He is whatever is good and beautiful. He is everything. Yet, He is still a friend and He shouts it out, 'You're my friends, don't you understand that? We're brothers. I'm not...I don't hold hell in my hands. I am not threatening you. I love you. I want you to enjoy life together with me.'" "Christ is Everything. He is joy, He is life, He is light. He is the true light who makes man joyful, makes him soar with happiness; makes him see everything, everybody; makes him feel for everyone, to want everyone with him, everyone with Christ." "Love Christ and put nothing before His Love. Christ is Everything. He is the source of life, the ultimate desire, He is everything. Everything beautiful is in Christ." "Somebody who is Christ's must love Christ, and when he loves Christ he is delivered from the Devil, from hell and from death."